In My Mailbox is a weekly meme hosted by Kristi at The Story Siren. 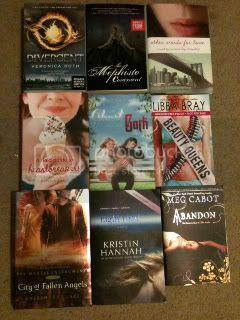 I had a great week, but completely broke my book buying ban due to uhhh, Teen Book Con overload. Ch-ch-check it out! Let me know what you think of DIvergent. I keep hearing really great things about it! I love Stacey Jay's Ghost and the Goth series. SO good! YAY! We both got our signed copies of Other Words For Love..does yours look like mind? I posted a pic in my IMM post. Awesome IMM! Looks like a ton of good reads :) Enjoy! You've got some good stuff there!!! I have only read "A Great and Terrible Beauty" by Libby Bray so interested in checking out "Beauty Queens"
Oh my goodness. Soo incredibly jealous over here. 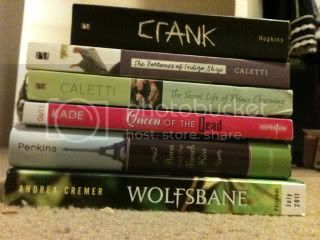 You got an awesome stack of books this week!!! OH man! I really want to read Beauty Queens!!! !